FOR THE "SECOND HOLY SEE-MEXICO CONFERENCE ON INTERNATIONAL MIGRATION"
I greet all those taking part in this Second Holy See-Mexico Conference on International Migration, and wish especially to thank the organizers and presenters. This meeting is taking place on the twenty-fifth anniversary of the reestablishment of diplomatic relations between the United Mexican States and the Holy See. It is thus an opportunity to strengthen and renew the bonds of cooperation and understanding between us, in order to continue to work jointly on behalf of the needy and the marginalized in our society. At this time, when the International Community is engaged in two processes aimed at the adoption of two global compacts, one on refugees and the other on safe, orderly and regular migration, I encourage you in your work and your efforts to ground responsibility for the shared global management of international migration in the values of justice, solidarity and compassion. This demands a change in mindset: we must move from considering others as threats to our comfort to valuing them as persons whose life experience and values can contribute greatly to the enrichment of our society. 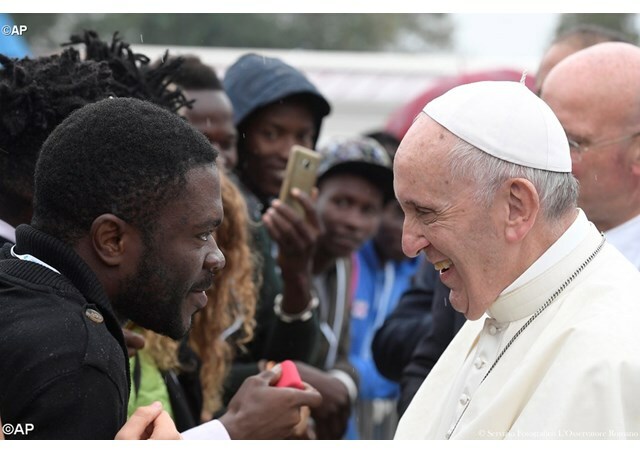 For this to happen, our basic approach must be “to encounter the other, to welcome, to know and to acknowledge him or her” (Homily for the World Day of Migrants and Refugees, 14 January 2018). In order to acknowledge and respond to the current migration situation, the assistance of the entire international community is needed, since its transnational dimension exceeds the capacities and resources of many States. Such international cooperation is important at every stage of migration: from departing one’s country of origin all the way to reaching one’s destination, as well as facilitating reentry and transit. In each of these countries, migrants are vulnerable, feeling alone and isolated. The recognition of this fact is vitally important if we wish to give a concrete and dignified response to this humanitarian challenge. Finally, I would like to point out that the issue of migration is not simply one of numbers, but of persons, each with his or her own history, culture, feelings and aspirations… These persons, our brothers and sisters, need “ongoing protection”, independently of whatever migrant status they may have. Their fundamental rights and their dignity need to be protected and defended. Particular concern must be shown for migrant children and their families, those who are victims of human trafficking rings, and those displaced due to conflicts, natural disasters and persecution. All of them hope that we will have the courage to tear down the wall of “comfortable and silent complicity” that worsens their helplessness; they are waiting for us to show them concern, compassion and devotion. I give thanks to God for your work and service, and I encourage you to continue your efforts to respond to the plea of our brothers and sisters, who ask us to recognize them as such, to give them an opportunity to live in dignity and peace, and in so doing, to contribute to the development of peoples. To all I willingly impart my Apostolic Blessing.